Today there are many ‘experts’ who state that creation is an accident, that it somehow just happened, that ‘nothing’ suddenly exploded and became ‘everything’. They say that natural evolution determines the development of species from nothing to complex and was entirely due to natural selection and accidental progression. They also say that there is no such thing as fate or destiny. They deny any higher power and scoff at spiritual pursuits. According to Vedanta this is nothing new; such hypotheses have been around for millions if not billions of years and all have been refuted by both ancient and contemporary sages who ‘know’ the highest truth; they know it because they made the effort to discover it. This effort however is not directed in the ever-changing transient material world of the scientists and theorists, but is directed deep within to the one thing that never changes … the seeker himself. The search for the Highest Truth comprises a series of posts relating the somewhat unusual life of the author/contributor; a life of apparent ‘accidents’ and ‘coincidences’ that drew the author to India and the highest spiritual path of all. They are mostly chronological, but in places reflect upon past events that tie into the current point with the benefit of hindsight. In 1974 or 1975 I purchased a book out of curiosity that was to change my life forever. Like most people who are drawn to India, I had an interest since childhood in things mystical. I pursued my interest on and off throughout my late teens and early twenties, reading through volumes on psychology, self-hypnosis, occultism, the tarot, science fiction and the like. The Tarot – A contemporary course of the quintessence of Hermetic Occultism, by Mouni Sadhu. There were a number of other books in the catalogue, but none had as many pages nor such an impressive title. I decided that this was the book for me. I also requested Initiations by Paul Sedir and ordered that too if available, but received the book Initiations by Elisabeth Haich instead. I hoped that these books with grand titles would contain what it was I was looking for, even though I hadn’t really got a clue what it was I was actually seeking, though it had something to do with power (now there’s a surprise). ‘Initiations’ was interesting, but not what I was looking for, but it did mention a great master in India and Paul Brunton who sat at His feet. 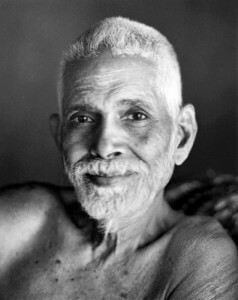 I then started to wade through ‘The Tarot’ and soon realised that this was going to be a lifetime’s work, until I came across an inference by the author that all occult study has limited goals and cannot lead to the highest truth; he then mentions his master in India, Bhagavan Sri Ramana Maharshi, who embodied the highest truth and recommended his book In Days of Great Peace. Out of curiosity I decided to purchase every book by Mouni Sadhu. I also hoped that they would contain the means to understand ‘The Tarot’ fully. As soon as I opened ‘In Days of Great Peace’ I saw a photograph of an old man with sweet smile and powerful eyes and thought “He looks like a nice bloke”; by the time I was a quarter of the way through it I realised that I had found what I had really been looking for all of my life and it certainly wasn’t occultism … from that moment onwards everything changed and a deep longing started to grow inside me to travel to India and Arunachala, the holy mountain where Ramana Maharshi had lived. I also wanted what was described in the book with such certainty that my whole life was turned upside down. There was also some curiosity about whether this was the same mountain that an Indian friend of my mother’s had travelled to many years before, in an effort to collect some secret herbs to cure her cancer, which unfortunately came too late. I was also curious to understand how a lump of rock could be considered holy by anyone. I became vegetarian overnight and decided to give up my low-life ways and become a perfect husband and father. Though this took some time, it totally threw my wife and finally led to her divorcing me a few years later, primarily because I was no longer the low-life person that she had married and the sudden change had frightened her. The thirst for greater understanding and to read more about Advaita grew day by day. I searched for the address of Sri Ramanasramam and wrote to them requesting a publications list and then proceeded to order every small book in English that was available. When they arrived after about six weeks, I started to read them but found that I could not really understand this ‘self – Self’ thing, nor could I really understand what was required in practice to attain this Self-realization that they spoke of. I therefore decided to order the remainder of the English books from the ashram to try to fully understand Advaita and what had to be done. It was several months before they arrived. In the meantime I returned to my main preoccupation with the Tarot, but could not get much further. Ways to Self-Realization, one of books recommended by Mouni Sadhu, which apparently offered some light on these aspects was not available, so I hoped that the ashram publications might provide the insight I needed. Whilst waiting for the books, I continued to study the parts of the Tarot that I could actually follow in more detail and though it contains a lot of interesting esoteric material, it failed to really grab me. Again and again, throughout the book I came across hints about the limitations of this and all associated paths. The Kabbala which plays a very important role in occult ritual seemed to be a complete waste of time, because it, like occultism, is limited in its scope to the astral planes and it also depicts God as ‘That’ which cannot or must not be approached. The Bible and Tora (upon which it is based) are no better. All depict God as unattainable, they describe a God who is full of love, anger and vengeance, who punishes wrongdoers and yet is all-forgiving if you fall on your knees and worship Him – in other words no better than the average politician. Even in my school days I found this difficult to believe, the contradictions were plentiful and everything seemed to be aimed at one thing, keeping the priests in control. In my youth I asked priests and teachers what the verses they were so fond of quoting actually meant, the reply was either “I don’t know – I just teach it” or some other equally obscure quote. They all failed to provide answers to my questions about the purpose of creation, of birth, suffering and death. At the age of 13 I attended Religious Instruction classes at school for the last time after the teacher admitted that he didn’t understand anything he was teaching. That afternoon as I walked home from school I called upon God to prove to me that He existed, because no-one else could. People looked at me strangely as I pleaded with God aloud, but I did not receive any answer. This all led to my turning my back on any form of organised faith, because those who purported to teach and lead it were as clueless as I was. My search turned to occultism and all sorts of other mind stuff in an effort to get at the truth I so desperately wanted to know. Yet, one small statement I once read in a Bible stuck with me like glue, it was “the light is so close you miss it”, a quote I could never find again and even came to doubt if I had ever seen it in the first place. I wanted to know what this light was and how it could be so close and be missed. In my early years I also wanted powers just like my heroes in the comics and I used to play at controlling the flame of a candle with thought alone; whether this really succeeded or not I don’t know, but it appeared to work and I spent many hours concentrating on candles to make the flame increase and decrease at will. Then one evening after school I was sitting on the couch in front of the fire, trying to make the fire brighter, but instead found myself viewing the the world as if from the end of a tunnel. It was a wonderful feeling of complete peace, but I must have stopped breathing because my mother panicked and shook me to see if I was still alive. I liked that feeling but could never repeat the experience, so forgot all about it and it was some years later after I started work, that the next profound experience came just as unexpectedly. School had never really interested me and I got permission to leave a year early to start work. My first job was as a trainee chef and I worked at a restaurant about 10 miles from my home. Each night we were taken home by the staff taxi, which was an old London cab with a glass pane in the roof. One night I had to wait in the back of the cab for a staff member who was late, and out of boredom I stared up at the sky which was filled with stars. For some reason the thought “what are you really ?” arose powerfully in my mind and suddenly I experienced the whole universe rushing inside me. I must have gasped or something because the person sitting next to me shook me forcefully and asked if I was OK. I said “yes” and left it at that. I had no idea what these experiences meant and forgot about them for several years, concentrating instead on work and trying to survive in what seemed to be a life over which I had little or no control, except to pursue the vices of youth, vices which on one hand attracted me and on the other repelled me because I could not see the point behind them. A couple of years later I was working as a hall porter in a hotel in Ripon, North Yorkshire, and on my day off I would often go to Fountains Abbey to search for a reputed underground tunnel linking the abbey with the town cathedral – I never found it, but one Easter Sunday I was late leaving the abbey and found myself locked in the grounds alone. It was a warm evening and as the sun started to set I went into the ruins and found myself beneath the great window where the alter once stood. Suddenly I felt as if hundreds of pairs of eyes were watching me from behind and a strong feeling of belonging overwhelmed me. I cautiously turned to see if anyone was there, but it was empty and the feeling vanished immediately. This experience left a profound impression on my mind, but nothing that I could really put a finger on. It was during my time at Ripon that my mother died. Two days before she died, though in a state of morphine based coma, she apparently demanded that I return home to see her, I was reluctant, not wanting to see my mother in that condition, but nevertheless returned home. Upon my arrival I greeted her and though still apparently unconscious, she took my hand and said “I never knew … please forgive me for everything … don’t worry about anything in your life, everything will turn out all right” and then fell silent. I tried in vain to ask her to explain what she meant, but no answer was forthcoming. I returned to work that evening and the following day she passed away. These and other small coincidences and experiences all helped to sustain in me a belief that there ‘was’ something out there, something profoundly powerful, something beyond anything that any teachers had so far been able to relate to me in their answers. After returning to Ripon I decided that I would leave work and hitch-hike around the world. I had heard of Rishikesh and Tibet, had read about mystics, mysteries and mind-enhancing drugs and wanted to participate, but mostly I wanted to find something to answer the deep inner urge that was driving me onwards. In October that year (1968) I set off with a rucksack and twelve pounds. I got as far as Garmisch Partenkirchen before running out of money after making a very expensive phone call back to England (I was very naive at that time) and had to be repatriated. To accomplish that I had to return to Munich and managed to get a lift the whole way. I had not eaten anything for over a week other than a small breadcake each day and made my way to the consulate expecting to be repatriated the same day. The receptionist in the consulate told me that I did not look ill or starving enough to warrant repatriation and advised me to come back after another week. I told her that I hadn’t eaten for a week and would probably die after a second week. She took pity on me and loaned me three marks on the condition that I repaid it when I got home. I returned to the consulate after another week and was repatriated thanks to the kind receptionist. I arrived back at my home at 11.00pm at night on a very cold and frosty November night. My sister had taken over the house along with my mother’s ex-partner and when I arrived on the doorstep they told me to sleep in the street. I begged them to let me stay for the night and left the following morning for my grandmother’s house eleven miles away. As I had no money and could not get a lift, I walked the entire way. My reception there was warmer and I stayed for a couple of months until I found a live-in job at a motel as a cocktail barman. It was there that I became something of an alcoholic in an effort to diminish my depression at having no home and no-one to turn to in times of need. I would often ask my mother for help as if she was still alive and then one night one of the other males in the accommodation block woke me and told me that my mother was on the phone. I replied that my mother was dead, but he insisted and I went to the phone thinking it was a hoax. On the phone I heard my mother’s voice say ‘Don’t worry son, everything will be all right’. I tried to reply, but the line went dead. I really do not know if this was a dream or real, because when I asked the person the next day, he denied all knowledge of waking me for the call. However, my room mates were annoyed at being woken up so late. It was a conundrum. After the motel I moved to Stratford upon Avon for a few months and then moved to the seaside town that was to become my home for the remainder of my life. It was here that my interest in the Tarot arose after purchasing a deck of cards and the tiny book accompanying them. I set about learning how to read them and even went so far as to prepare a 50 year prediction for the UK and world in general. Remarkably most of the predictions came true exactly as and when predicted over the next forty years (mostly politics as I had an interest at that time). I made other small predictions which also came true and this reinforced my belief that there was a higher power ruling and guiding the universe. And thus my journey began in earnest, an inner drive to somewhere I had yet to find, until that fateful day that I opened the book by Mouni Sadhu and found the road home. This entry was posted in Spiritual Paths on 28/04/2011 by Admin. This entry was posted in Spiritual Paths on 01/03/2013 by Admin.